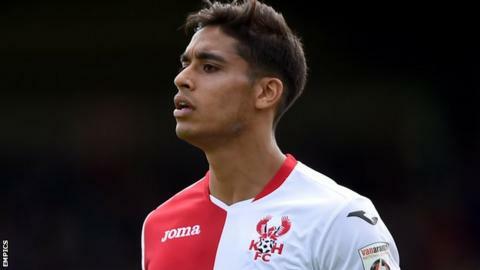 Torquay United midfielder Aman Verma is undergoing tests after collapsing at home after a training session. The 27-year-old was sick during a gym session last week and was taken ill again later in the evening. "He's very worried because he thought it was an off day, and it might just be a virus that has hit him hard," Torquay manager Kevin Nicholson told BBC Sport. "But with all that's gone on lately in football with things like heart problems we couldn't take any chances." Verma joined Torquay on loan from Kidderminster in November and the deal has since been extended until the end of the season. "He's feeling fine now but the doctors have told him to do pretty much nothing, so he's bored out of his mind as he just has to rest until he's given the all-clear," Nicholson said. It is hoped Verma will get the result of his tests on Monday, but he will miss Torquay's game with Chester on Saturday, having also sat out Tuesday's FA Trophy draw with Macclesfield. "He was in a gym session and he was sick," Nicholson said. "The immediate reaction when that happens is the lads take the mick as he they thought he was broken in the gym, but it's not like him as he's a very fit lad. "He started immediately with headaches and then in the evening he collapsed when he went to go to the toilet. "He went to be looked at by the doctor the next morning and they couldn't get to the bottom of what it was after having all kinds of tests and since then he's been out of commission and he's had a few other tests." In December 2014, winger Courtney Cameron was taken to hospital by a teammate after suffering acute headaches and dizziness, which was later diagnosed as a problem with his teeth.